Are you plagued by reverse delegation? Are the assignments others should be performing piling up on your desk? Sadly, many managers find themselves running out of time while their employees are running out of work. 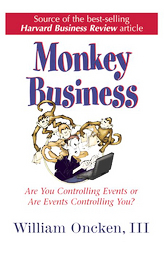 Monkey Business is written to help hopelessly overwhelmed managers get these monkeys off their backs and return them into the hands of those they hire. Monkey Business contains valuable information on how managers can: Train employees to become self-reliant rather than boss-reliant; Free up time for personal and professional relationships; Attend properly to planning, organizing, and leadership—making sure things stay on time, on track, and under budget; Confront the belief that "If you want something done right, you've got to do it yourself."